I had posted a few weeks previously about Unibroue’s “La Terrible”. I felt that it was one of the best beers I had ever tasted. One of the reasons I loved it so much was that it had a fascinating mouthfeel, a very complex texture complemented by wonderful flavors. 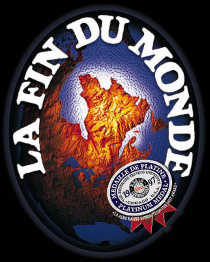 After writing that post, there were quite a few people who commented that I should try Unibroue’s “La Fin du Monde” (The End of the World)–an interesting name for a beer, I thought. I had opportunity to pick up it from the new Whole Foods on Arroyo Parkway in Pasadena, along with some pre-made, frozen cioppino and a rosemary ciabatta loaf from Trader Joe’s. I made the cioppino, which was very easy to make. So easy, in fact, it made me think about a fellow blogger’s post about the merits of pre-made Trader Joe’s foods. At any rate, within about 10 minutes I had two steaming bowls of cioppino, the warmed rosemary loaf, and a freshly-opened bottle of “La Fin du Monde”. The End of the World was a very good beer, with nice carbonation and a bit of hops hitting me upon the first sip. The scent was full of orange and spring, and blossomed into notes of orange, coriander, and maybe a little bit of custard. It was zesty and spicy. It wasn’t as full as “La Terrible”, nor did it have the same delightful texture of “La Terrible”. It would be the refreshing, warm-weather cousin of “La Terrible”, which is a darker, heavier beer (“La Terrible” has a port-like character to it, which I found disqualifies it from being a thirst-quencher). “La Fin du Monde” was actually a pretty good match for the cioppino on account of the herbal/spicy characteristics they both shared, as well as zinginess and bright acidity of the beer pairing with that from the tomato base of the soup. “La Fin du Monde” is similar to Avery’s “White Rascal” or Hoegaarden, but as opposed to those beers, it has an ABV of 9%. I would recommend it highly. Those French-Canadians certainly know how to make their beers!